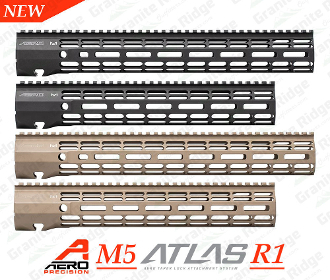 Aero Precision R-ONE Handguards are now available for the M5 platform. Machined from 6061-T6 Aluminum, the R-ONE offers a lightweight and slim profile that features a full-length top Picatinny rail section allowing the user to accessorize their build as needed. Our proprietary ATLAS attachment system is a durable and dependable mounting platform that maintains the slim profile while still providing the strength and stability customers have grown to love from Aero Precision handguards. Available in KeyMod and M-LOK® profiles with 12" and 15" options. - Every handguard includes the barrel nut and mounting hardware. *Please note - This handguard is specific to the M5 platform. It is not compatible with the AR15/M4E1 platform.